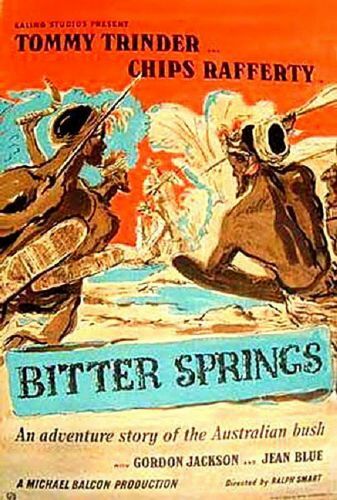 British comic actor Tommy Trinder and Australia's biggest film star Chips Rafferty teamed up for the 1950 film Bitter Springs. The plot is propelled along by Rafferty, who intrudes on the sacred hunting grounds of an aborigine tribe. Though tempers flare, everyone eventually buries the hatchet. The film is sentimental in the extreme, but is pulled off with a minimum of syrup. Bitter Springs was directed by future Secret Agent and The Avengers stalwart Ralph Smart.